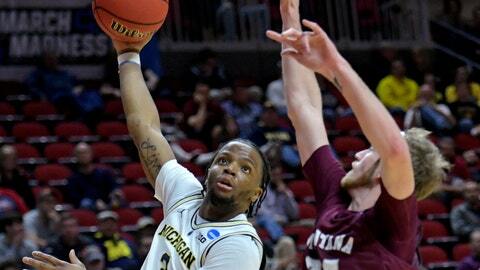 The Wolverines (29-6) are in the round of 32 for the third straight year. DES MOINES, Iowa (AP) — Michigan coach John Beilein didn’t need to worry after all. Four days after his Wolverines’ disappointing loss in the Big Ten Tournament championship game, they did exactly what they were supposed to against 15th-seeded Montana in the first round of the NCAA Tournament. Charles Matthews had 22 points and 10 rebounds in his best performance since coming back from injury. Ignas Brazdeikis added 14 points and seven rebounds, and Jon Teske had 11 points and nine boards for the Wolverines, who led by as many as 27 points in the second half. Sayeed Pridgett had 17 points for Montana (26-9). The Grizzlies’ 33-percent shooting from the field was their second-worst of the season. Michigan: The Wolverines put the loss to Michigan State in their rearview mirror with an easy win over the Grizzlies. Now it’s on to what figures to be a challenging game against a defensive-oriented No. 10 seed in Florida. The Wolverines beat the Gators in the Elite Eight on their way to the 2013 national championship game. Montana’s Pridgett made the prettiest play of the game when, starting on the right wing, he put a spin move on Teske while driving to the basket and finished with a left-handed reverse layup early in the second half. Montana: DeCuire loses a lot of scoring punch from a team that won 52 games the last two seasons, the best stretch in program history.